They lived in a smart suburban home, owned nice cars and posed together on family holidays. 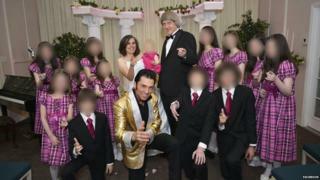 Outwardly, the California couple accused of torturing, imprisoning and endangering their 13 children presided over a happy American family. But when police entered their home on Sunday, they found a very different reality from the one that David and Louise Turpin posted to Facebook. Prosecutors say they found the couple's 13 children, aged from two to 29, in a state of severe malnutrition. The couple have denied all the charges against them. What have we been told so far? Prosecutors have painted a disturbing picture of a couple who "punished" their children over a period of years by tying them to their beds for weeks or months, first with ropes and later - after one escaped - with chains and padlocks. Punishments also took the form of beatings or strangulations. District Attorney Mike Hestrin said the children were forced to live nocturnally, and were allowed to shower only once a year. There was evidence they were not freed from their shackles to go to the bathroom, he said. He said they were only allowed to eat one meal a day but their parents would taunt them with food. "The parents would apparently buy food for themselves and not allow the children to eat it," Mr Hestrin told reporters. "They would buy food... apple pies, pumpkin pies, leave it on the counter, let the children look at it but not eat the food." Some of the children were suffering from brain and nerve damage caused by the prolonged abuse, Mr Hestrin said. They had not visited a doctor in more than four years and had never seen a dentist, he added. Despite being "home-schooled" they lacked even basic knowledge of the outside world and did not know what a police officer was, he also said. They were however allowed to write in journals, and hundreds were recovered from the home. How was the situation discovered? The alarm was raised when a 17-year-old girl called police saying she had escaped the house by climbing out of a window. Mr Hestrin said the girl and her siblings had planned the escape for two years. He said another of the siblings had escaped with the teenager but became afraid and returned to the house. Riverside County Sheriff's Capt Greg Fellows, speaking alongside Mr Hestrin, said the girl had photographs to back up her story. When police arrived at the house one of the couple's children was still chained to a bed and two others may have just been released, Mr Hestrin said. What have family members said? 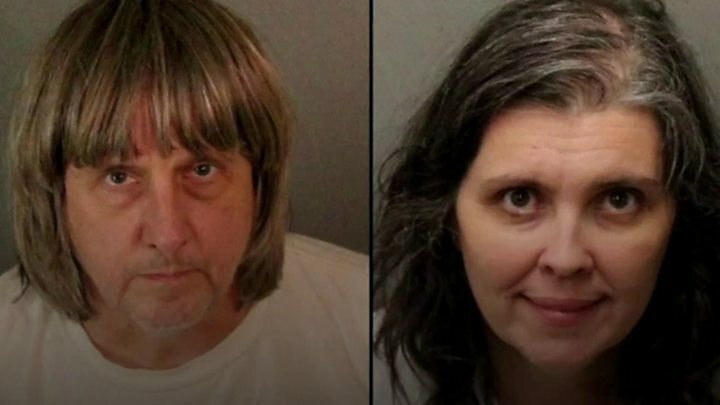 David Turpin's parents, James and Betty Turpin, told ABC News they were "surprised and shocked" at the allegations made against the couple, describing them as "the sweetest family". They said their grandchildren were home-schooled, and that they had not seen their son and daughter-in-law in several years, although they had spoken by phone. Referring to David and Louise, they said "God called on them" to have as many children as they did. They also said the children were given "very strict" home-schooling and they had to memorise long passages of the Bible. Some of the children were aiming to learn it in its entirety, they said. Despite this, the school listed at their address is on public records as "non-religious". When the grandparents last visited the family, four or five years ago, they noticed the children "looked thin", they said, but they seemed like a "happy family". The sister of Louise Turpin, Elizabeth Flores, told ABC's Good Morning America programme that she had never felt comfortable around her brother-in-law, and accused him of watching her in the shower when she briefly lived with the couple. "I thought they were really strict, but I didn't see any abuse," Ms Flores said. Another sister, Teresa Robinette, said she was "hurt and shocked" by the revelations about the children's alleged treatment. "I always made comments to Louise when I did talk to her, about, 'Gosh, they're so skinny.' And she would laugh it off: 'Well David's so tall and lanky. They're going to be like him'," she told NBC's Today programme. Residents in California have struggled to comprehend the discovery at the spacious Turpin family home located on Muir Woods Road in Perris, some 59 miles (95km) south-east of Los Angeles. "I can't believe this. I can't believe this. It's so sad," neighbour Jennifer Luna told CBS News. Andrew Santillan, who lives nearby, told the network: "I had no idea this was going on. I didn't know there were kids in the house." Nicole Gooding, who has lived in the neighbourhood for three years, told Reuters news agency the first time she saw the family was two months ago when the mother and children were cleaning the garden. "I had never seen them at all until that day," she said. Other neighbours expressed concern about the appearance of the children and said they rarely saw them playing outside. The couple had lived at their current California address since 2014, and moved to the state from Texas in 2010. A family who say they bought their old home outside Fort Worth in 1999 shared photographs of its condition with a local CBS news affiliate on Wednesday. The images appear to show extremely dirty surroundings and scratches on the backs of doors and walls, which the family said they assumed were from animals. A neighbour at another Texas address, Shelly Vinyard, told CBS that she used to describe their house as like a "religious compound". She said she remembered asking one of the girls her name, but the girl responded that she wasn't allowed to tell people it. As with what happened inside their home, the family kept any serious financial troubles hidden from public view. Mr Turpin is said to have had a relatively well-paid job as an engineer at aeronautics and defence technology company Northrop Grumman. Mrs Turpin is listed in public records as a housewife, with no income. With many children and only one earner, public records suggest the family's expenses exceeded their income. Bankruptcy documents show Mr Turpin earned more than $140,000 (£124,000) in 2011, but that the family's expenses exceeded his take-home pay by more than $1,000 a month. A lawyer who represented the couple when they filed for bankruptcy for a second time in 2011, Ivan Trahan, told the Los Angeles Times: "To me and my wife, Nancy, who was with me during the interviews, we always thought of them as very nice people who spoke highly of their children."